This is a photograph of the Terrace Bay Beach from 1950. 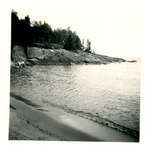 This is a photograph of the Pump House Beach in Terrace Bay from 1950. This is a photograph of people having a picnic at a beach in Terrace Bay. Terrace Bay - 1950; Tom Williscroft, Mrs. Williscroft, Don Whitley, Hugh Brophy, ?, Jack Todd, ?, and Joan Wyatt. This is a photograph of a group of people from Terrace Bay from the 1950s. This is a photograph of an event in Terrace Bay. This is a photograph of an event at the Moose Lodge in Terrace Bay. Some of the people in the photograph are Kennedy, Wally S. + girl, Al Allen + girl, Dolly Sitko, and Arlene D.
Santa Clause visited the children of Terrace Bay. In this photograph, Santa Clause is Marvin Steen. This is a photograph of Santa Clause paying a visit to the children of Terrace Bay. This is a photograph depicting "the way things were" in the early years of Terrace Bay. This is a photograph of curlers in Terrace Bay.